What is Mudjacking Concrete Lifting? HMI offers you two options of mobile technology. We took four decades of experience in estimating and brought the paper process of yesterday into today’s technology. Click on the following links to watch how this technology can help you manage your business! Estimate Rocket a cloud-based service to streamline your business operations! CLICK HERE for a FREE 30 Day Trial! 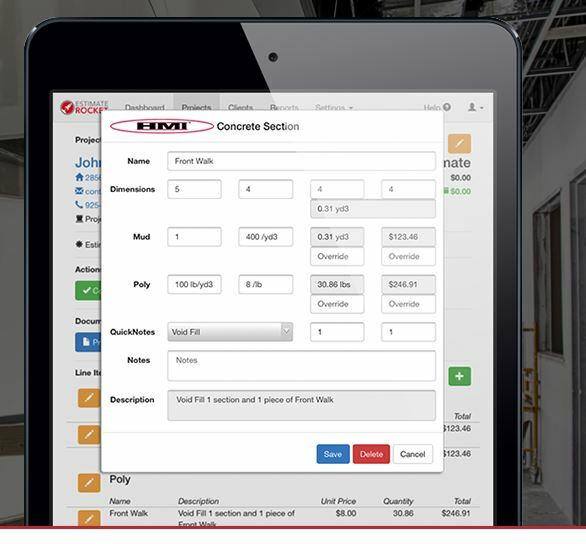 We have collaborated with Estimate Rocket to bring you a Concrete Raising Industry specific estimating and invoicing platform with built-in calculations. How is HMI Polyurethane Different? © 2019 Hydraulic Mudpumps Inc. All rights reserved.